Bourbon has proudly been produced in Kentucky using charred oak barrels since the 18th century, and two hundred years of tradition are in every Kentucky Woods Bourbon Barrel Cake. A Kentucky Woods Bourbon Barrel Cake starts off with a brown sugar cake that is blended with a chocolate cake that has been made with 3 kinds of aged Kentucky bourbon. It is topped with Walnuts and then baked, cooled and soaked in a secret process to bring out the essence of the cake and make it into a unique, moist, and decadently rich dessert. It is finally topped with a chocolate and maple caramel drizzle before it is packed into a handmade wood barrel cake box. 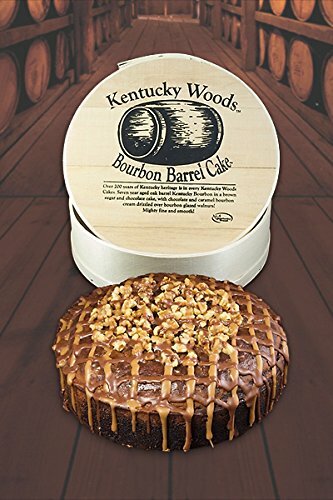 Anyone of any age can eat a slice of Kentucky Woods Barrel Cake, too: even though each cake is made with bourbon, it cooks out during the baking leaving less than .5% alcohol as a result. The cake retains its rich bourbon taste through a unique recipe that preserves the essence of the bourbon flavor without any alcohol. This cake weighs a full 50oz. (more than 3 pounds!) and measures appx. 10" across. You should easily be able to get 12 slices per cake, and even more than that if you cut brownie-style square pieces. If you have any questions about this product by A Taste of Kentucky, contact us by completing and submitting the form below. If you are looking for a specif part number, please include it with your message. Dulcet Gourmet Food Gift Baskets- Includes: Black and Whites, Lemon Bundt Cake, Blueberry Muffin, Corn Muffin, Assorted Rugelach. Ideal Gift Idea!